Mexican artist Frida Kahlo is known for her colorful self-portraits. An exhibit of her personal photographs, discovered more than half a century after her death, offers insight into her life. But it also raises some questions. Frida Kahlo, who died in 1954, is one of Mexico's best-known artists. She was the subject of the 2002 movie "Frida" starring Salma Hayek. The 240 photos in the new exhibit at Artisphere in Arlington, Virginia, were chosen from more than 6,000 discovered recently in the home Kahlo shared with her husband, Diego Rivera. Only four are known to have been taken by the artist herself, including one of her dog and a portrait of her nephew. “She actually wrote on the back of the photo: Frida Kahlo,” says Cynthia Connolly, Artisphere’s visual arts curator. Frida’s bus accident, dramatized in the movie "Frida," caused severe injuries to her spine. In the exhibit, several images show her in a hospital. “You can tell she had pain most of her life," Connolly says. "She was continually having surgeries to try and relieve her of that pain." Other photos show family and friends, including photographer Nickolas Muray. 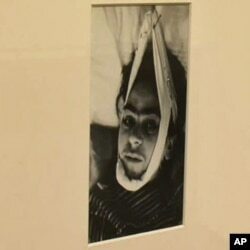 An image of Frida Kahlo in the hospital after a bus accident which left her with lingering health problems. "What you see in his studio is very interesting, because with the magnifying glass, you can actually see there's a portrait of Frida Kahlo on the wall," Connolly says. There are also self-portraits of her father, who was a professional photographer. 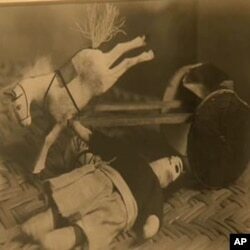 Frida collected photographs by other artists such as Man Ray.